SAN DIEGO, Calif.--(BUSINESS WIRE)--Scientific study of the evolution of the southern end of the San Andreas Fault is of vital importance given the earthquake-prone nature of southern California. Mapping fault zones and land surface changes that resulted from previous earthquakes can deepen the understanding of hazards posed by the fault, including the possibility of future temblors. 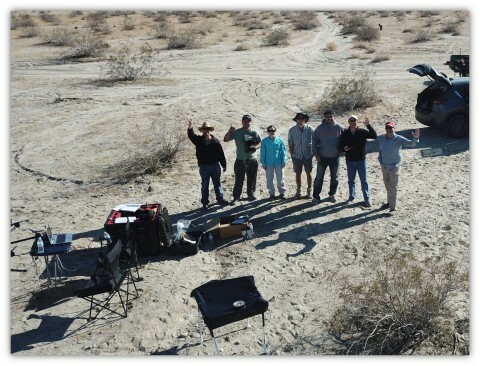 Geodetics is deepening its relationship with Velodyne by expanding its Geo-MMS product offering with integration with the Velodyne's ULTRA Puck™ VLP-32C. 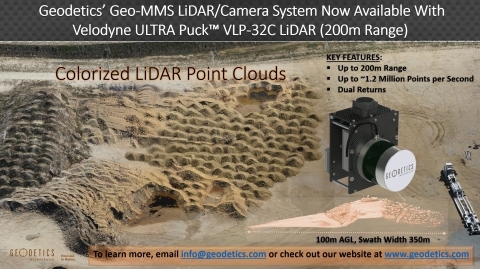 The VLP-32C is a long-range LiDAR sensor that combines best-in-class performance with a small form factor. It is a high-resolution LiDAR sensor that is cost effective compared to similar performance sensors and retains innovative breakthroughs such as 360° surround view along with real-time 3D data that includes distance and calibrated reflectivity measurements along with rotational angles.